Charcoal & Black Sugar Polishing Mask: Unique 2-in-1 exfoliating mask with purifying Charcoal and exfoliating Black Sugar works double time to detox skin. Perfect for all skin types. Dead Sea Minerals Anti-Stress Mask: Award-winning clay mask with Dead Sea Minerals replenishes, re-balances, and makes skin radiant. Perfect for all skin types. Cucumber Peel-Off Mask: Super-cooling Cucumber peel-off mask lifts impurities to reveal fresh, silky-smooth skin! Perfect for normal to combination skin. 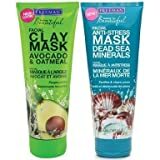 Avocado & Oatmeal Clay Mask: Creamy clay mask with Avocado and Oatmeal purifies and nourishes for a super soft, clean finish. Perfect for normal to combination skin. Freeman Facial Mask Sweet Tea & Lemon Peel Away 6 oz. This calming mask instantly absorbs excess oil. Clarifies and purges clogged pores. Dead Sea Minerals contain natural supplements that are essential for maintaining healthy skin. Sea Salts help replenish and balance moisture. Lavender and Bergamot promote relaxing aromatherapy.